Senior housing is categorized by the level of care available to residents. At one end of the spectrum, there are communities that offer little or no care; at the other, facilities that provide continuous care. Between those extremes are a wide range of housing choices that can meet changing needs. Independent Living: Condos, townhouses and single family homes that are smaller and more maintenance free than large family properties are frequently people's first choice, especially if they're healthy and active. Active Adult Senior Retirement Homes and Communities: Active adult senior retirement homes and communities aim to service the interests of active adults over the age of 55. Housing types often include condos, townhouses and single-family properties, and all are designed with an eye toward delivering a maintenance-free lifestyle for residents. Such communities offer a vast array of on-site activities, including exercise, social clubs, art instruction and lecture series. Assisted Living Senior Retirement Homes and Communities: Residents live in their own apartments, but have the benefit of an on-site staff, meal service in communal dining spaces, and planned activities and outings. Some assisted living communities also offer access to nurses and daily living assistance. Others may offer more extensive medical and personal services. Adult Family Senior Retirement Homes: Such properties are licensed to care for up to six residents in a home setting. Services typically include meals and housing maintenance and attending to residents' safety and care. Facilities may specialize in addressing specific health concerns and provide care and an environment tailored to those conditions. Alzheimer's and Dementia Care: Facilities specialize in caring for patients with dementia and Alzheimer's disease offer programs that address residents' needs and provide an environment where they can live safely. Housing services typically include personal care, such as bathing and dressing and administering medicine, along with dining and housekeeping. In addition, many buildings incorporate over 50 design features, such as safe wandering paths and color coded areas to help with way-finding. Such designs provide comfort and ease residents' anxiety. Continuing Care Retirement Living Communities: A Continuing Care Retirement Living Community offer progressive levels of assistance, depending on a person's needs. They include independent and assisted living and nursing care. Choosing the appropriate senior living arrangement is challenging, not only because it entails an emotional dimension, but also because of the complex issues you need to weigh, such as cost, location, services, amenities, activities, and current and future care needs. One of the biggest transitions we make as we get older is deciding when it is time to move to a smaller home or condo, or sometimes when to move from home ownership to a senior community. THESE ARE HARD DECISIONS for us to make and sometimes even harder conversations to have with aging parents or loved ones ... YOU ARE NOT ALONE! We have developed seminars and workshops with a panel of experts because so many families are going through the same things and facing the same issues. Get advice about caring for senior transitions from people who have experience with it and understand what you're going through. During the year we host several different seminars and workshops designed to inform you so that you and your loved ones can make the best, most informed decisions for this transition. If you would like to receive notification of future workshops please call our office at 734-392-6021 or email us at Bruce@BruceWebb.com. We offer a variety of Guest Speakers at our different events to offer information and advice on all the different aspects involved with deciding or preparing for this type of transition. REALTORS® who carry the Seniors Real Estate Specialist® (SRES®) designation are specially qualified to address the real estate needs of those age 50+. SRES® designees recognize that a home often is the largest and most precious asset that baby boomers and people 50+ have. Thus, SRES® designees bring a unique approach to each transaction and interaction with clients. They not only offer a deep knowledge of real estate and the local and economic issues shaping market trends, but they're also educated on issues of particular concern to aged 50+ clients. There's almost always an emotional element associated with selling a long-time home. SRES® designees are real estate agents that specialize in senior needs and can ease the transition first by talking about your reasons for selling and then exploring all the options—either modifying and staying in your current home or finding a different property—to be sure you find the very best housing solution. SRES® designees use their expertise and industry knowledge to provide an honest assessment of your property and make suggestions for improving it for saleability. They may recommend hiring staging professionals who can make modifications that will best showcase your house and make it appeal to the broadest audience possible. SRES® designees can also provide insight on current market conditions, determine how your property stacks up against the competition and develop a pricing and marketing strategy to sell your home quickly and for the highest possible price. SRES® designees can help assemble an appropriate team to ease the transition to a new property. Movers, landscapers and stagers can handle the heavy lifting. Attorneys, specialists and mortgage brokers can manage the heavy paperwork. SRES® designees can also help you find your new home locally or refer you to designees elsewhere to find property in a new city or near children. Seniors Real Estate Specialists® or SRES® designees are REALTORS® qualified to address the needs of home buyers and sellers age 50+. The SRES® Council awards the SRES® Designation to those members who have successfully completed its education program. By earning the SRES® Designation, your REALTOR® has demonstrated the necessary knowledge and expertise to counsel clients age 50+ through major financial and lifestyle transitions involved in relocating, refinancing, or selling the family home. Your SRES® has received special training, gets regular updates, and is prepared to offer the options and information needed in making life changing decisions. CLICK HERE to order Your FREE Book TODAY! Please provide the book title along with your name and address on the contact form. Allow 7-10 days for delivery. Order Your FREE Booklet TODAY! To receive your free booklet please call 734-392-6021 to leave your name and address or email it to Bruce@BruceWebb.com. Please allow 7-10 days for delivery. 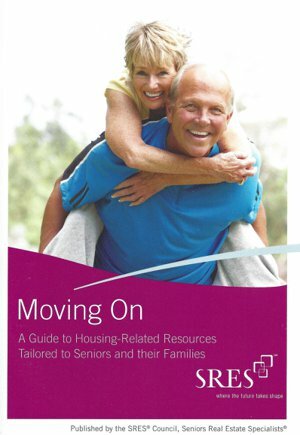 NOTE: The resources on this page are designed for seniors, caregivers and others who want more information about assisting seniors. As a Senior Real Estate Specialist, I am committed, along with my team, to providing solutions for seniors and those who care about them. It is our mission to, through our referral network, be a complete source to finding ethical, competent, caring and trusted professionals offering solutions for seniors with a respected reputation in the community for senior services. Are Open Floor Plans Just Too Open?? How to Handle Social Security Benefits When a Senior Dies? Man Caves and She Shacks: Your Personal Retreat? You Want to Save for a House?? Discover Which Architectural Style Fits Your Personality? How to Put Your Housing Cost to Work for You? 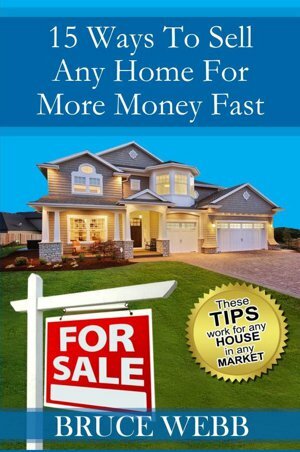 Is Your House Priced To Sell Immediately (PTSI)?? Crucial Steps to Planning a Successful Remodel? 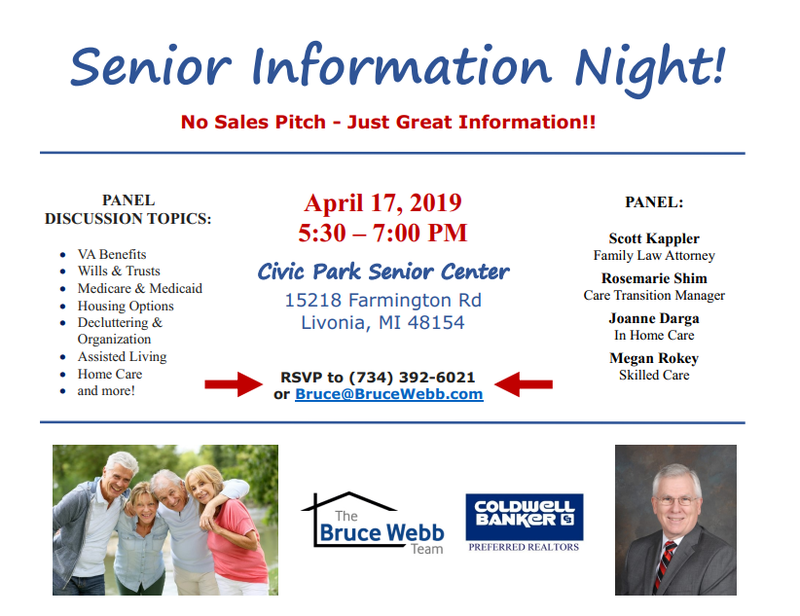 April - Senior Information Night in Livonia! Data not guaranteed. Verify independently. All warranties, express or implied, disclaimed.